Previously, I mentioned that I'd hoped the 2008 basic ballerina Barbie® dolls - which showed up with the "short" 2006 body just as playline Barbie dolls were switching back to the taller 1999 body - would be changed to the taller body at some point. Unfortunately, the body never did change, but some things about the blond doll did change over the course of the year. Both versions are based on the same design, but they seem to be different iterations of it. The cool thing is that they look totally different despite the fact that the only major changes are the colors of the lips and the lower highlight of the iris. ...and her two hair colors. So, the first two versions of the doll had strawberry blond hair (shown on the left side of the picture); the last dolls to show up in stores had ash blond hair instead (shown on the non-left side of the picture). But, my story of woe has a happy ending, because there's technically another version of this doll - Target's exclusive Christmas-themed ballerina doll (#M9530). She was only produced with the original strawberry blond hair, so the stress level was lower. This is the fifth year in a row that Target stores have sold a customized "Christmas" version of the annual basic Ballerina doll, but this one isn't quite like the ones from previous years. Up until now they've essentially been color variations of the originals, wearing the same outfits made over in Christmas-y fabrics and having the same face paint designs (usually with some color alterations, like red lips instead of pink). The 2008 doll is different because...she's different. Most noticeably, she does have the taller 1999 "belly button" body instead of the shorter 2006 body. Even more interestingly, the face paint is completely different. 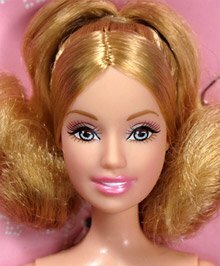 It's very similar to the Barbie as Eden Starling™ doll from the Barbie in a Christmas Carol movie, with the same steely green eye color. This face design is being used on a whole bunch of dolls this year, including the new basic ballerinas. Target's ballerina has the same hairstyle as the "regular" version, but she has the same tiara-slash-child size ring on her ponytail as last year's ballerina. (She has the same blurb about it on her box, too.) The mainline 2008 Ballerina doesn't have an accessory in her hair. The box is completely different as well, and she comes with a full-size brush instead of the small filigree brush the regular version has. There is one thing the Target doll has in common with her Christmas-y Ballerina forebears, and it's always been the best thing about them: Instead of "painted" legs, her legs are flesh-colored and she has removable fabric tights. In the end, the Target doll works better for what I was going to do than any of the "shortie" versions. (The last thing I need is more 2006 bodies with colored legs. ) However, if I'd somehow been able to get this version in the first place I might have missed out on all those variations, and what would a year be without three copies of the exact same doll that you can't bear to part with because they're all slightly different from each other even though you said you weren't going to do that this time?